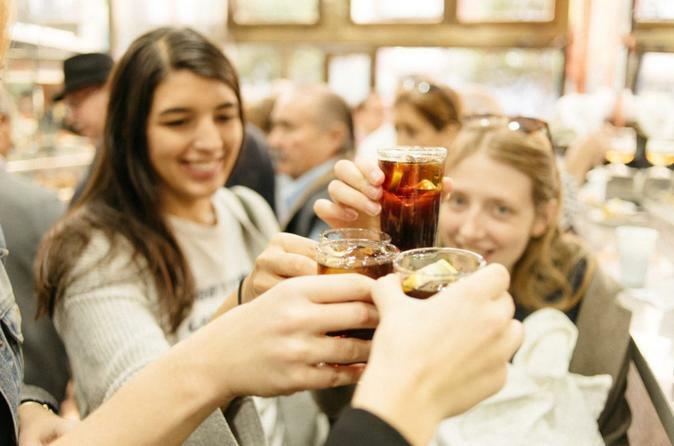 Join us for a true Madrid tapas crawl, led by a passionate foodie. Meet your guide for an action-packed evening-- you'll hop from tapas bar to tapas bar, tasting their signature drink (think locals wines, vermouth and draft beer!) and specialty tapas. You’ll devour the most typical Madrid tapas and learn the true art of a “tapeo”! You can’t leave Madrid without an authentic tapas crawl, and this is the best way to do it.You’ll visit four of the most authentic family-run gems in the city center, and pop in and out of the busy bars just like the locals do. By the end of the evening you’ll know exactly how to do tapas like a local, and have tasted some of Madrid’s best specialty tapas and drinks, which is enough food for dinner. Start your night off in true Madrid style—surrounded by locals as you sip vermouth and nibble on tapas. Your expert guide will let you in on the secret to this local aperitif tradition as you discover what going for tapas really means here in Spain. Next, head across one of Madrid’s main squares to a popular local tapas bar for a draft beer and delicious bites. You’ll learn the owner’s story and fall in love with the chef’s amazing food. At the third tapas bar, you’ll taste one of Madrid’s signature tapas, gambas al ajillo—a dish this family-run bar claims to have invented! They’ve been in business since 1906, so we’ll take their word for it! You’ll also be able to order a glass of wine made from the same family’s vineyard in the Toro region. Finally, you’ll squeeze into one of Madrid’s last remaining traditional tapas institutions– a no-frills place where locals pack in for favorite dishes (including the Madrid specialty– pig ear!). Adventurous or not, there’s something delicious for everyone at this spot. By the end of the night, you’ll know exactly what it means to do tapas like a local, and why tapas culture can’t exist outside of Spain (so you’ll have to come back! ).